Corn Capital Innovations > Innovation Blog > General > Should Your Corn be Knee High by the Fourth of July? Should Your Corn be Knee High by the Fourth of July? The Farmer’s Almanac used to predict that if corn was knee high by the Fourth of July, it would be a bumper crop. That was a way of measuring, back in our Grandpa’s day. This year we did our planting “back in time”, so will you go back in time to gauge your success next month? Of course, you have to take into consideration that this rule was created long before fine-tuned hybrids, high-octane fertilizers, fungicides, herbicides and even irrigation systems that are now part of farming. Nonetheless, I think we all have that phrase engrained in our memories. Over the years, we have forgotten about knee high and have based it on “high as an elephant’s eye”. But don’t forget that we should not base our expectations on what happened last year, but on the average over the past 20 years. As of right now, Renville and Redwood Counties in MN are really in good shape, and we can expect a leaf of growth every day – to day and a half! With that said, we are right on track to be knee high by the Fourth of July! We are actually right where we need to be. Did we do everything that we could have to prepare for the scenario that Mother Nature dealt us this spring? Did we buy the correct seed and plant it at the best depth and speed to maximize growth potential? Is our post-planting plan set to enhance the field conditions today? Every decision we made after harvest until now; will show if what we have done is correct. We believe that as long as every farmer keeps an eye on the conditions, adjusts accordingly to those needs both now, and throughout the growing season, we will not have any surprises come harvest time. 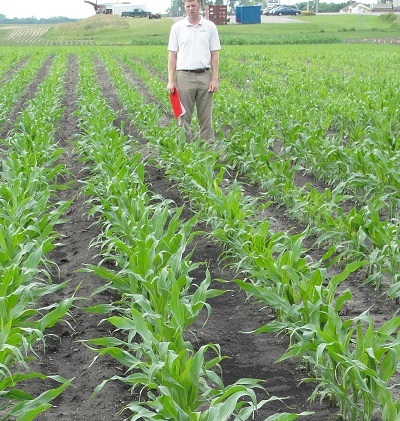 Tell us your prediction for your fields; are you on track for knee high by the 4th of July or even better? Categories: General | Tags: Corn Capital Innovations, Fungicide, Knee High by Fourth of July.